Pigeon Forge is a charming town surrounded by the Great Smoky Mountains in eastern Tennessee. There are so many things to do in Pigeon Forge, including some of the best attractions in the entire Smoky Mountain area. From fun attractions to restaurants and relaxing places to stay, there is no shortage of fun things to do here. Bring along your entire family and sure to have the time of their lives while on vacation in Pigeon Forge. If you are a huge Titanic movie fan you will really enjoy this museum. The Titanic Museum is shaped like a replica of the ship. When you first check in you will receive a boarding pass of a real Titanic passenger and experience what it was like to sail on the RMS Titanic while surrounded by more than 400 artifacts. Touch a real iceberg, walk the Grand Staircase and third class hallways, feel it with your own hands the 28-degree water, and try to stand on the sloping decks. At the end of the tour you can see whether or not the person on your card survived. Give yourself a good 2 hrs to go through this exhibit. It is definitely a walk through history and very informative. 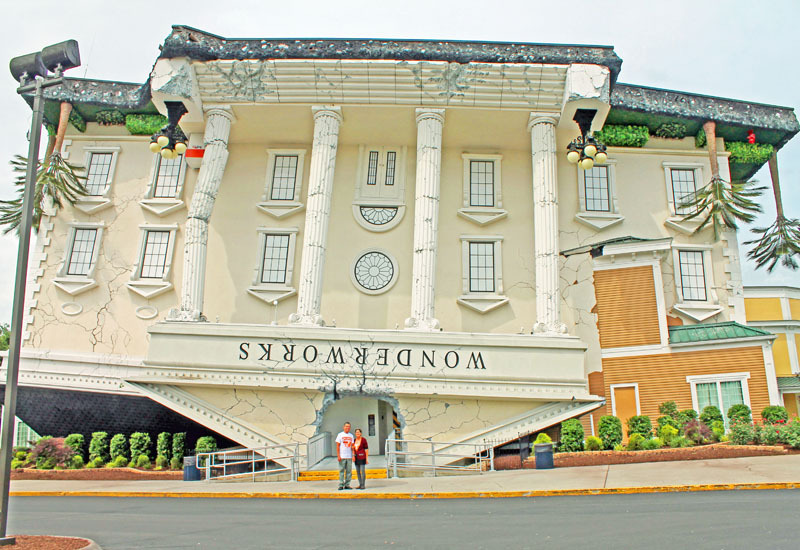 WonderWorks is an amusement park the exterior design of the building sets you up for a fabulous experience. The whole aesthetic outside is very cool with everything being upside down including the trees. With over 100 interactive exhibits for visitors of all ages. It does have some cool features such as: the trembling of a 6.0 Earthquake, lasertag arena, make human-size bubbles in the bubble lab, fly a fighter jet, lie on a bed of nails, ride to roller coaster simulation, experience rock climbing and test your skills on the New 50ft tall indoor ropes challenge course. You'll enjoy "The Wonders Of Magic" starring master magician Terry Evanswood. You don't have to travel to the West Coast to see your favorite celebrities up close. Located at Showplace Boulevard in Pigeon Forge, Hollywood Wax Museum is the only wax museum in the country devoted entirely to celebrity figures. 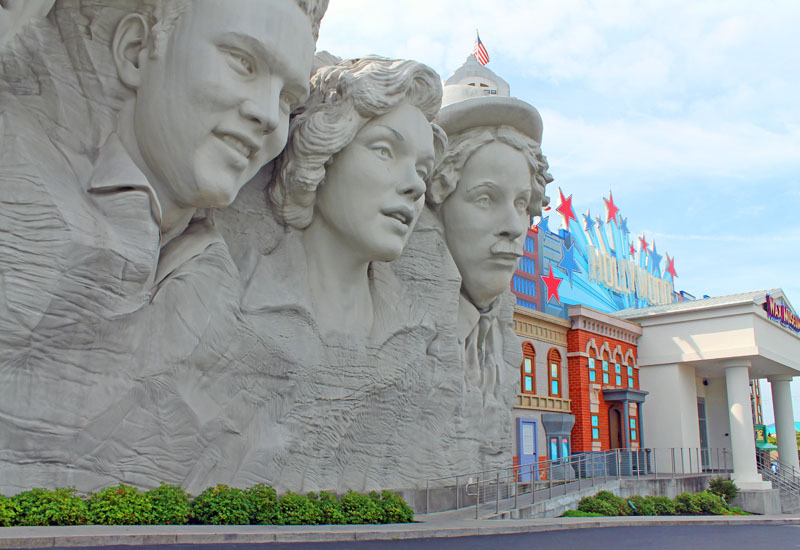 The two-story Museum brings Pigeon Forge tourists and locals into the world of Hollywood Stars and allows visitors to get close to some of the most famous people in show business, recreated so faithfully that you'd swear they are were alive. Hollywood Wax Museum houses tons of uncanny replicas, lots of fun photo opportunities for any ages. You can purchased this attraction with the package deal for the Wax Museum. Castle of Chaos has three different parts, 1. House of mirrors 2. Zombie haunted house 3. 5d arcade game. This haunted attraction combines the experiences of a 3D film, a ride, and a video game in one scary fun adventure. Explore a mysterious Pigeon Forge castle to discover the potential outbreak of paranormal activity. Buckle into your armchair and pick up your pistol as you prepare to see, hear, feel and smell the chaos while shooting for the highest score. Winners are shown on-screen at the end of every haunted ride. The Hatfield & McCoy Dinner Show become part of the longest running feud in history. Upon entering you get tickets, take pictures, then enter the theater. Inside the theater is where the entertainment begins. For dinner-- they offers all you can eat fried chicken, pulled pork, corn on the cob, cole slaw, mashed potatoes, dinner roll, tea/soda, & pudding. About the show: whether you're city-folk or country cousin, you'll love the singing and dancing, mighty feats of strength, jaw dropping stunts and side-splitting comedy. The chaos doesn't stop with fighting cousins. You'll see high-flying Hillbillies, diving dogs, and paddling pigs - there's always new surprises. The Island in Pigeon Forge is a 23-acre entertainment destination offering families affordable fun, both night and day. 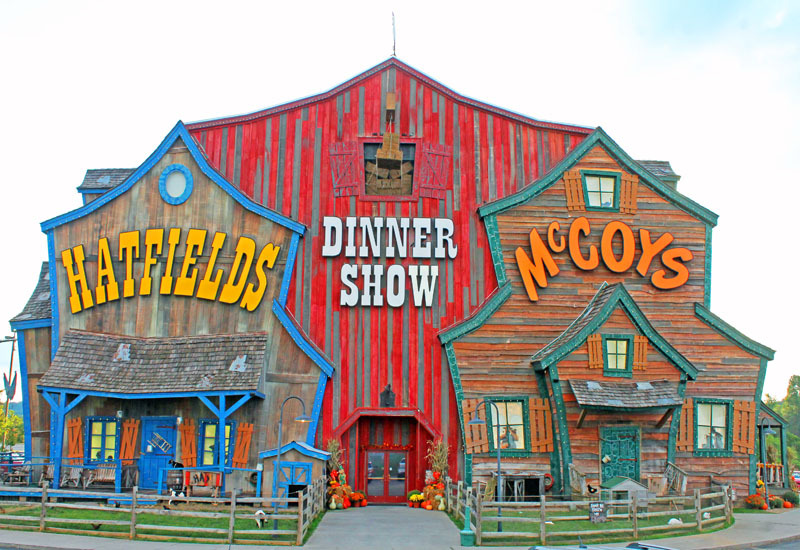 As one of the most unique shopping, dining and entertainment complexes in Pigeon Forge. The Island offers fun for all ages and any occasions. The Island is home to Jimmy Buffett's Margaritaville restaurant, the Margaritaville Island Hotel, Paula Deen's Family Kitchen, and many more. 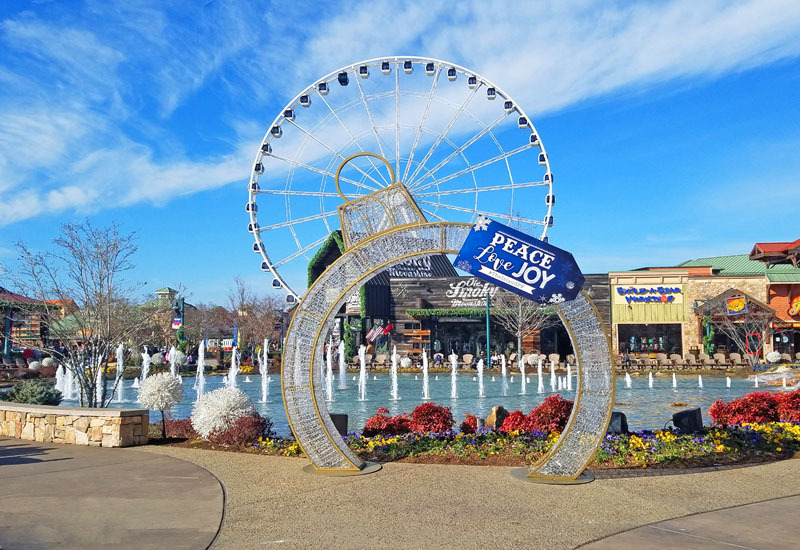 Showcased by The Great Smoky Mountain Wheel, a 200-foot-high observation wheel, and a multi-million dollar show fountain programed to perform to light and sound, The Island in Pigeon Forge is a must-stop on your next trip to East Tennessee. Try to do as much as you can while in Pigeon Forge, and save the rest for a repeat visit. To save some money, check out the Smoky Mountain Navigator site for printable coupons click here. I've never heard of Pigeon Forge, but it sounds like a cool place to visit. Hopefully I will make it out there someday. Pigeon Forge is the hometown of Dolly Parton a popular country music singer. She also built the Dollywood Amusement Park on the same town. This is one unique town with the Titanic and obscure museums. There are so many one of a kind places to visit. I agree, you discover a lot of things when your traveling. To be in a place like Pigeon Forge makes me feel relax and free souls. Lots of good memories to keep. All of these places sound fun! I have been to the Titanic museum in Branson before. One day I'd like to go to Pigeon Forge with my family. That dinner show sounds amazing! Fun theater show and good southern food all in one place . Only at Hatfield and McCoy! We are actually headed down to Tennessee in April. Never thought about visiting Pigeon Forge. Sounds like a fun place to go and visit. Will have to check it out. I've heard of Pigeon Forge but have never been there or anywhere in Tennessee. It sounds like you're found some fun things to do, I'd be up for checking some of them out. Love visiting Pigeon Forge. It reminds me of Branson as both have similar attractions but there's something about those Smokey Mountains that I really love. Pigeon Forge is not only for fun and amusement park. The Smoky Mountain is paradise for those who like adventure like hiking, zip-lining or river rafting. The mountain is pretty all year round. What I love the most is staying on a cabin and just admiring the beauty of Smokies on the outside deck. I'm a big fan of Pigeon Forge. And Wonderworks is always a blast to go and visit. Such a fun city. I totally agree, Pigeon Forge is a very unique town, I love everything about it. So many wonderful things to do! I would love to visit the Titanic Museum Attraction with my family when we do visit. Yes Titanic Museum is one of my favorite too :) I highly recommend it. So many things to love about Pigeon Forge. I think it's a fun place to go to especially if you have the whole family with you. Each attraction is going to be amazing! There is so much to see and do in Pigeon Force. The Island looks like a great attraction for kids. I bet my daughters would love that place! Oh wow, Pigeon Forge looks and sounds like a really great place to visit. I've never beent here, but would like to. Ashamed to say I haven't even heard of pigeon forge! I know I'd love the titanic museum and the Hatfield and McCoys restaurant! I love that there are plenty of museums here. It's not just for the kids but for the adults as well. It's such a cool place to visit! I've been to all the places you've listed and I couldn't agree more. One of my favorite towns to visit because it's got so much to offer! No dull moment in this town also the Smoky Mountain is right around the corner. Always beautiful all year round. I would love to visit any of these especially the Wonderworks. I wonder if I would feel dizzy looking at it up close hehehe. Pigeon Forge is indeed a revelation.So many fun places to enjoy. The Titanic Museum appealed the most. It would be quite an experience to relive partially those harrowing moments that the people aboard he Titanic went through. 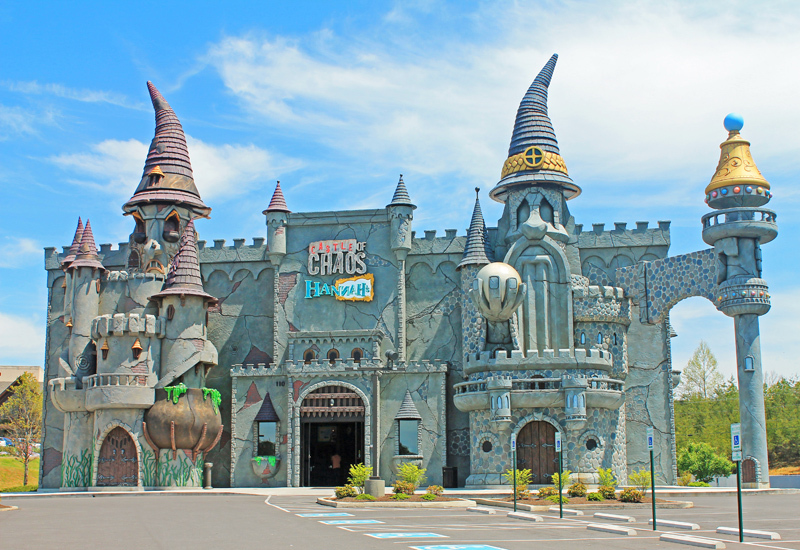 I'm in the UK so this was my first time hearing of The Pigeon Forge but I like the sound of the Castle of Chaos. But I also like the sound of Wonderworks as well, they all look like exciting attractions. I didn't realize Pigeon Forge had so many cool things to visit! I have to fit in a trip so I can experience that dinner theater! In Pigeon Forge there’s one show you don’t want to miss and it’s Country Tonite. The spectacular show features a variety of song, choreography, comedy and costume, impressive for the sheer quality of the talented performances and the seamless flow of the fast-paced, dynamic show.